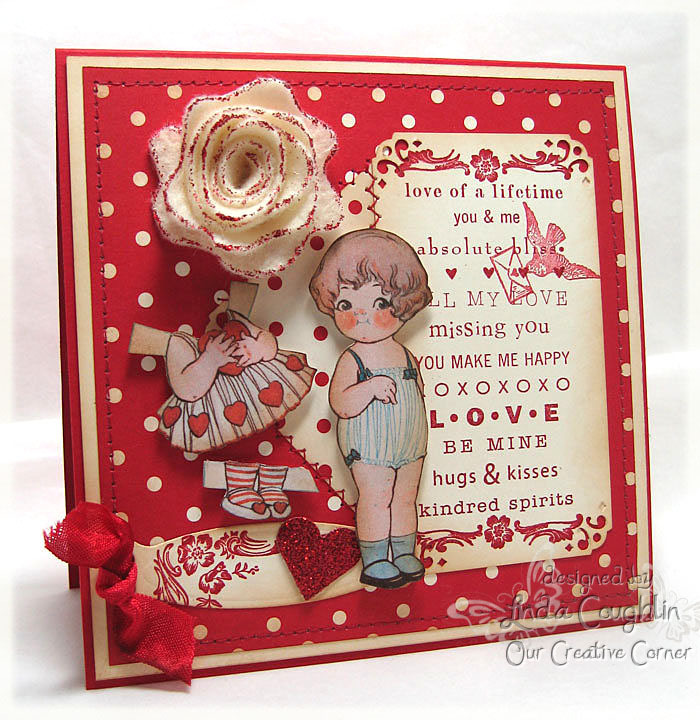 Hi Everyone, welcome back to Our Creative Corner! Thank you to all who participated in last week's challenge to 'Get Wordy' - we're going through all your entries, look out for our favourite picks later in the week! This week our hostess is Sarah Gough - THinkING STAMPS and she's asking us to Distress to De-Stress using the provided sketch! 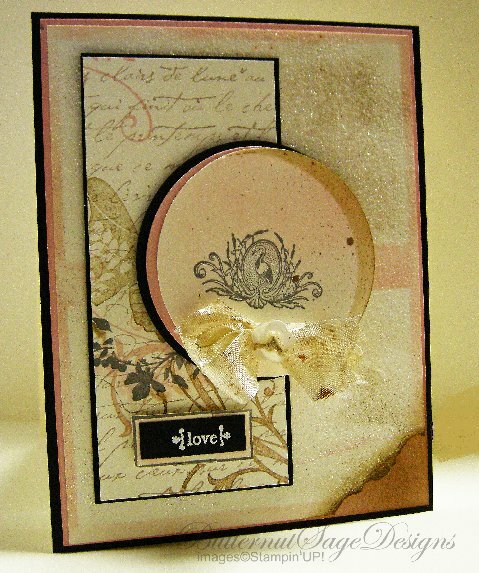 Stamping is a great way to relax and distressing your card is a fun way to work out a little frustration. 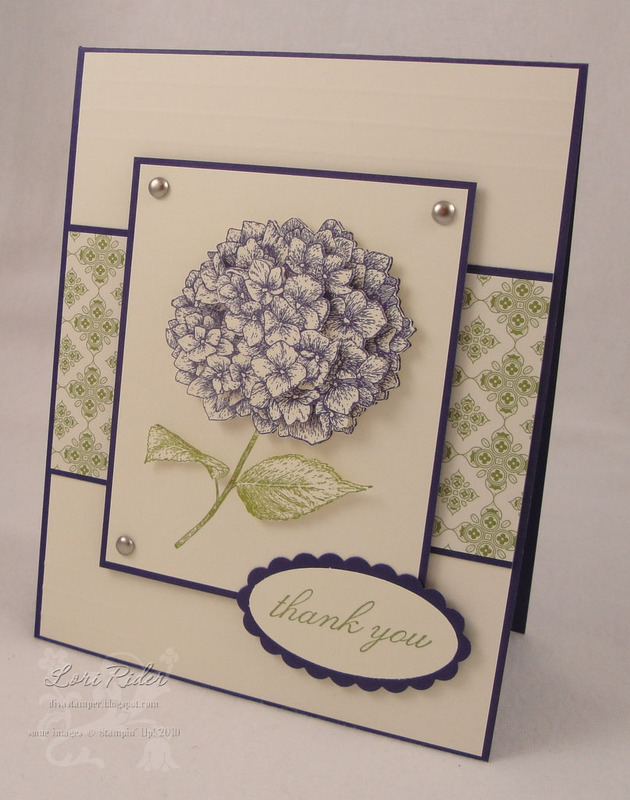 This week crumple flowers, distress edges or sponge your stress away while you work with the sketch! We'll be looking for gorgeously distressed cards that work with the sketch for our creative awards next week! We may have had a record number of players with the OCC last week - wow! 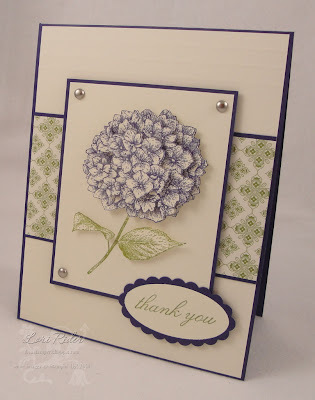 It was truly amazing and we are so grateful for everyone that played along with the Cut It Out challenge. Of course, lots of entries meant lots of possible winners, but we narrowed it down to these wonderful projects. We loved the combination of the sensational paper piecing and the beautiful soft and girly embellishments. The coloring is simply gorgeous as well. Congratulations, Kylie! 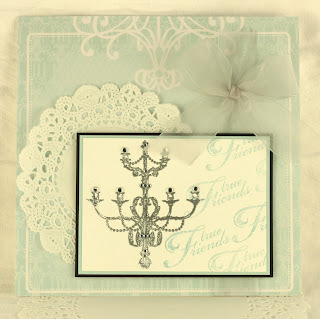 Please feel free to display the Top Talent badge on your blog and watch for an email about a future guest designer spot! 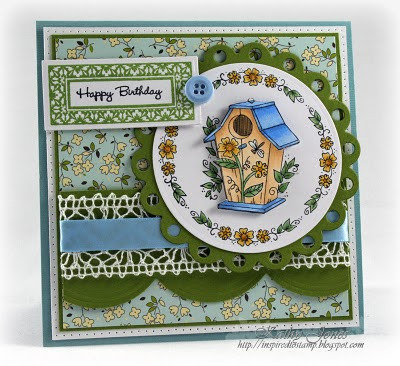 Kathy's card is gorgeously finished with beautiful colors, and her hand-cut birdhouse is the epitome of fussy cutting. Her design and embellishments are just fabulous. 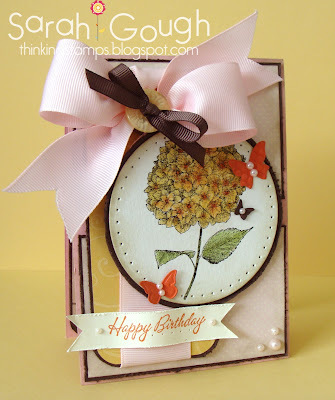 This card is full of amazing textures and the flowers are perfectly cut. The embellishments and die-cuts provide the perfect finishing touches with the gorgeous color scheme and design. 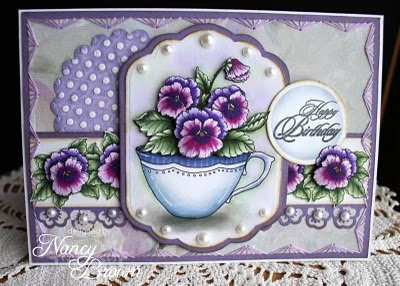 The layering of the cut-out pansies is wonderful on Nancy's card, and she combined the beautiful colors with such lovely embellishments. 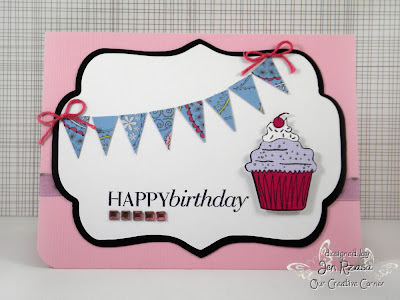 Congratulations to all the Talented Trio winners this week - you can grab the badge to display on your blogs and we hope you'll come play along with us again! 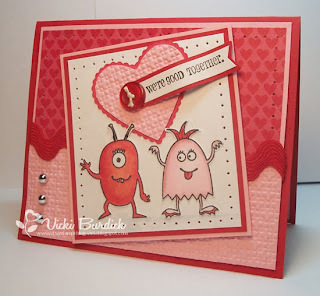 Don't forget to join in the Getting Wordy challenge that closes Friday night - we are enjoying seeing the creations that have been posted so far. And of course we'll be back on Saturday with more fun for the coming week! 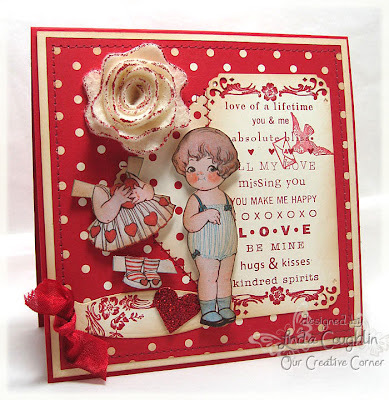 Hi Everyone, welcome back to Our Creative Corner! Thank you to all who participated in last week's challenge to 'Cut It Out' - your entries were amazing, look out for our favourite picks later in the week! 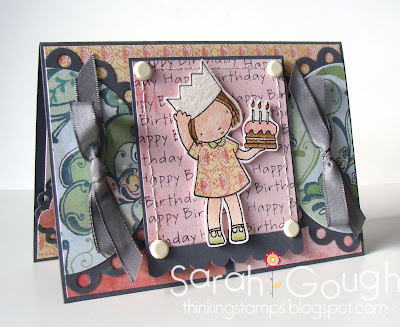 This week our hostess is Sarah Gough - THinkING STAMPS and she's asking us to Get Wordy! 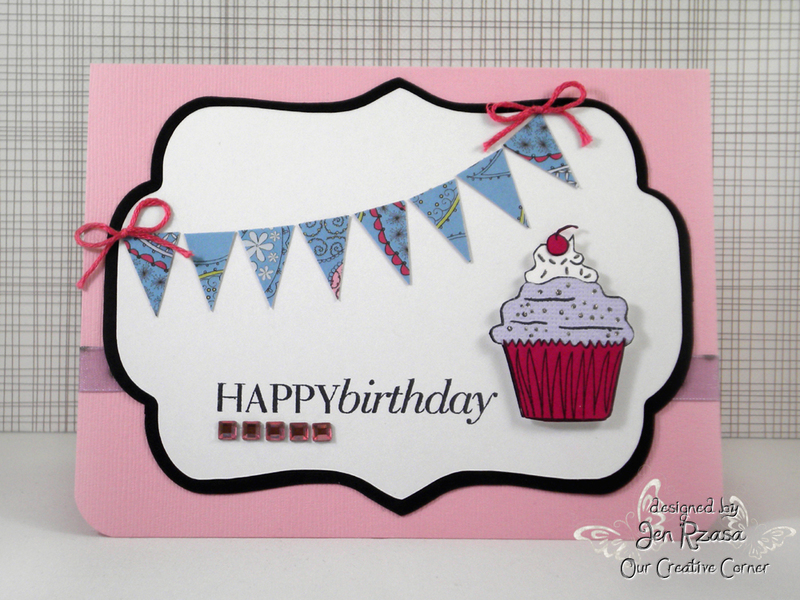 For this challenge, use a sentiment stamp to create a background or layer on your card by stamping it repeatedly. 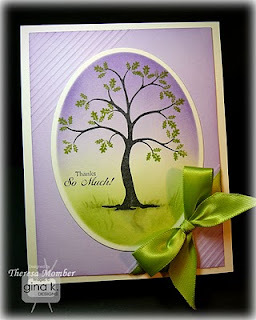 What a wonderful collection of cards you guys made for the Branch Out challenge! We loved looking at all of them and it was a tough decision for the Corner's Choice winners this week. Thanks to everyone who played along! 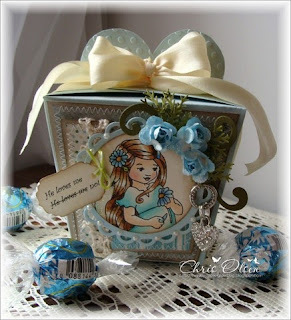 We loved the crisp and clean, perfectly CAS style, the composition with the gorgeous silhouette image, and the pop of blue from the pretty ribbon. Congratulations to Eva! Please feel free to grab the Top Talent Award from our sidebar to display on your blog. 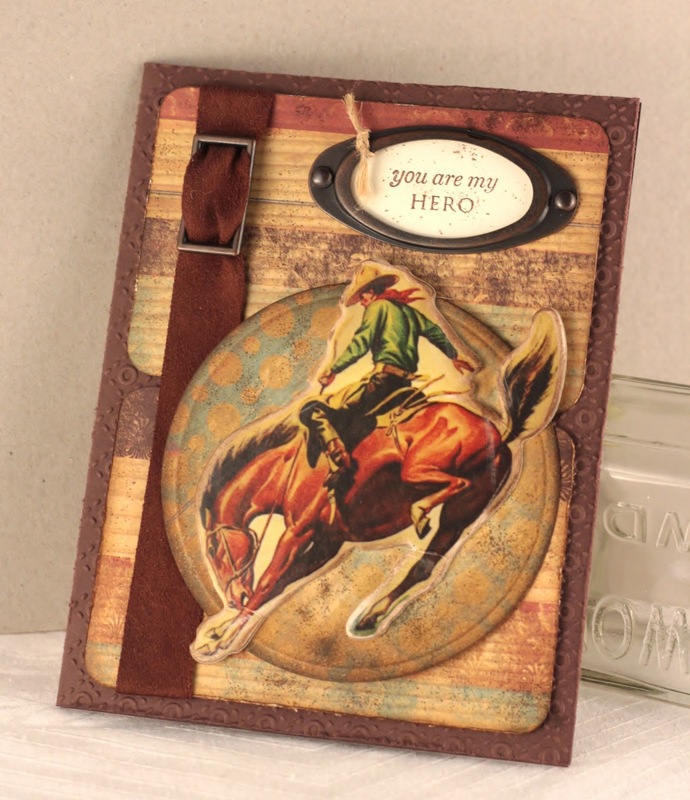 We will be contacting you about a guest designer spot with us. The team chose this soft and pretty card for its CAS style and gorgeous details. The beautiful colors are perfectly accented with the Flowersoft for a creation that really caught our eye. 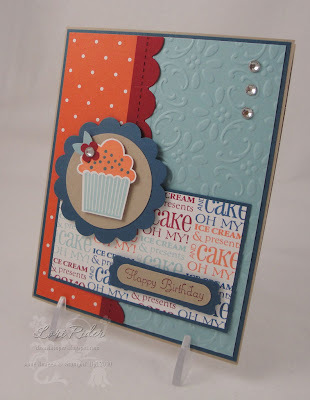 There is so much to love about Theresa's card: gorgeous and striking colors, amazing sponging, and the perfect CAS texture that the corner scoring adds. The artistry of this card is outstanding. 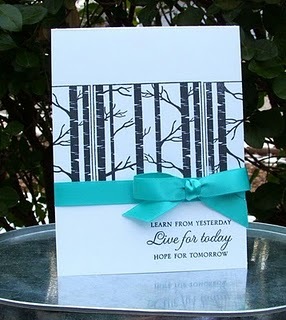 Maarit's brayer and masking techniques and color choice are amazing, and the white details add depth and beauty while keeping the simplicity. We want to congratulate all the Talented Trio Award winners - please feel free to display our badge on your blogs! 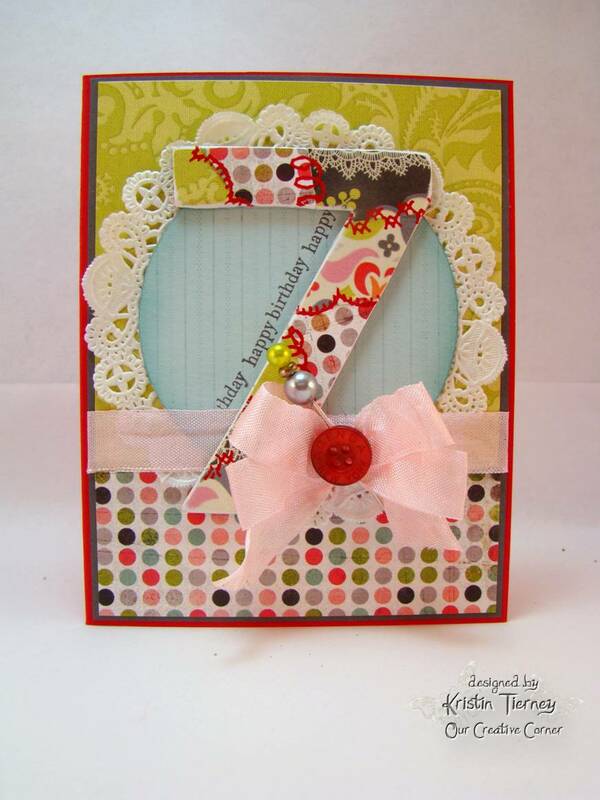 It's not too late to get in on the fun with the Cut It Out challenge so get out those paper snips and enter by Friday night! Then be sure to come back on Saturday to see what we have in store for our next challenge. 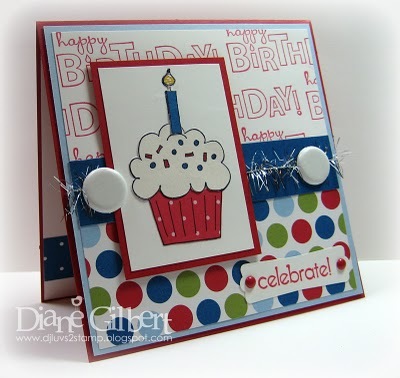 We couldn't do this weekly challenge without all the fabulous stampers who participate - please come and join us! Thanks so much for stopping by to see our latest challenge! 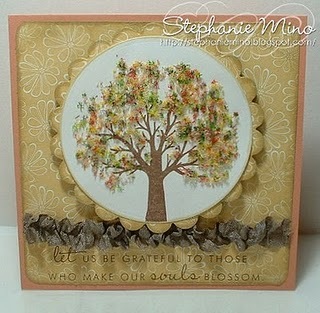 We loved seeing your fabulous tree cards last week and can't wait to see what you come up with next. 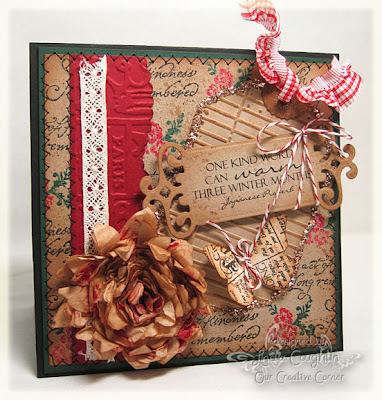 This week our host, Lori Rider, is challenging us to feature some kind of cutting technique in our projects. 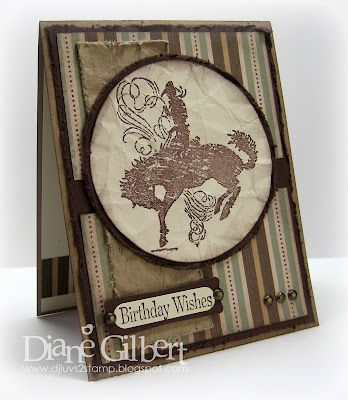 Some examples of possible techniques could be paper piecing, fussy cutting, out of the box, paper tole, etc. 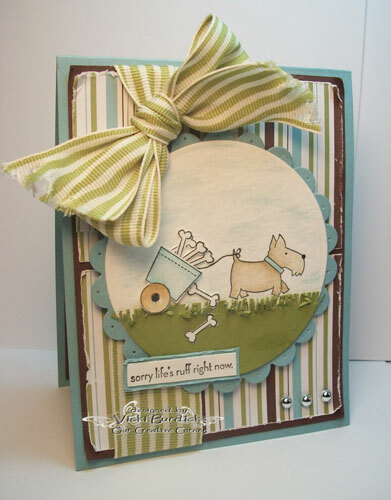 Anything that requires you to get out your paper snips will qualify! Everyone is welcome to play along. If you upload your card/project to SCS, please use the keyword OCCC. Our only requirement is that your project be a new project and not back-linked to a project made before this challenge started. Please be sure you link back to the OCC blog post in order to be eligible for our Corner's Choice awards. We had so many beautiful Valentines projects entered into our challenge last week and want each and every one of you to know how thrilled we were that you joined in. 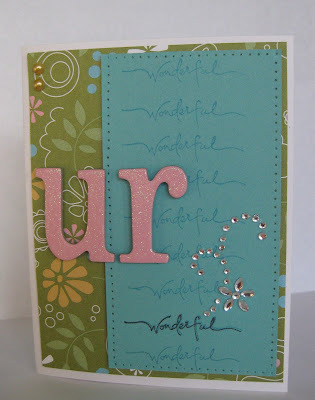 The designers had a wonderful time visiting all your blogs and seeing your creations up close and personal. But many beautiful projects made for a tough judging choice. 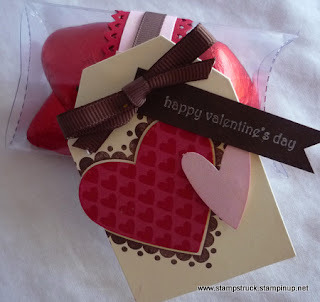 Here are our awards for the 3-D Valentine project. 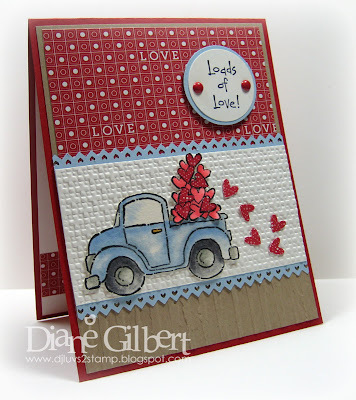 Donna's gorgeous box stopped us in our tracks! Beautifully crafted with a clean and simple yet elegant feel, this box shows wonderful attention to detail. 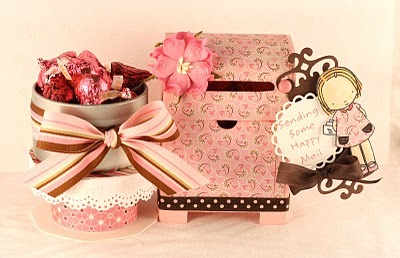 The beautiful ribbon, bow, curled paper treatment on the lid pulls it all together. Congratulations Donna! Please feel free to grab the Top Talent Award from our sidebar to display on your blog. 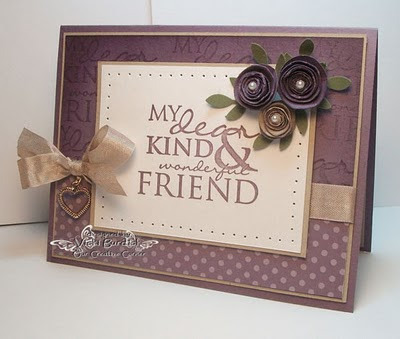 We would like to offer you a guest designer spot and will be contacting you with the details. We think this darling little gift box shows superb attention to detail with its beautifully color coordinated flowers, papers and coloring. 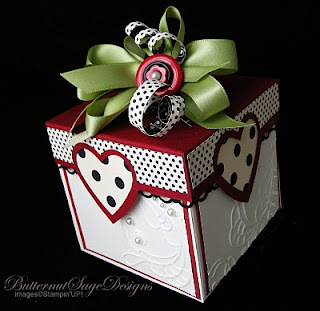 All of the yummy extras add visual interest without distracting the eye and the silver heart on the ring conveys the Valentine feel wonderfully. 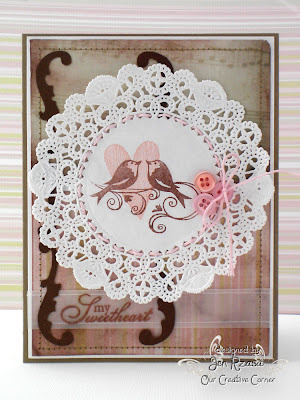 Sue's project is super sweet and we love the red/pink/chocolate color combination. 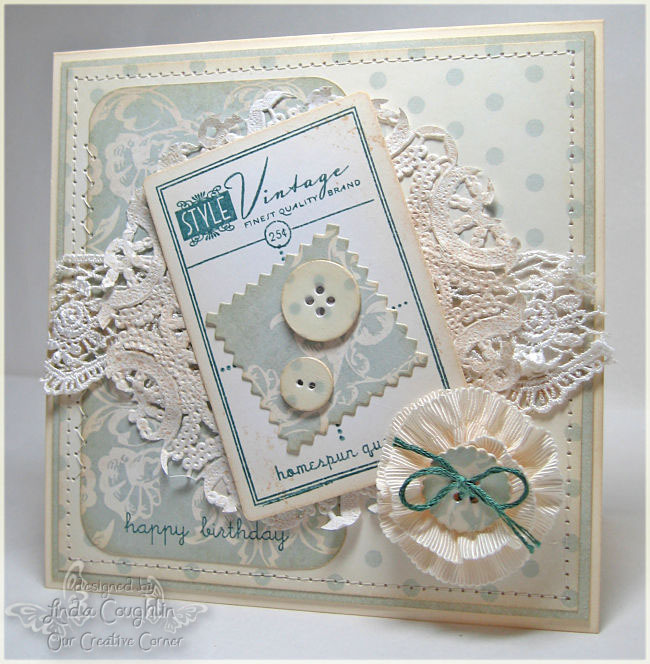 The tag has a lovely CAS feel to it and the band around the clear pillow box is perfect. 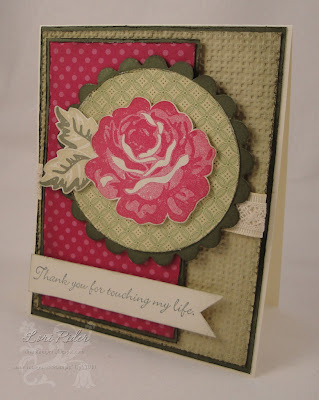 An altogether fun gift for her children's teachers! We're still drooling over Nelia's cookies, but that's not why we picked her project. 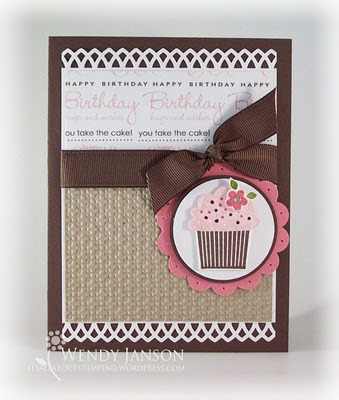 We think it's sweet that the packaging matches the cookies and that there is also a matching card and envelope. The way she made the box from an envelope die and layered the scalloped edges together is terrific design work. A big congratulations to all of our Talented Trio Award winners this week. 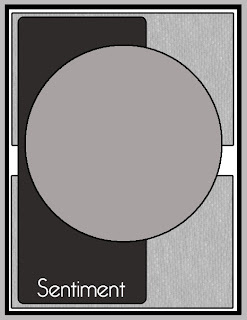 Ladies, we hope you will grab the award badge from our sidebar and proudly display it on yours. Don't forget, there is still time for you to play in our Branch Out challenge that closes Friday night, February 11th. We love all the wonderful creations that have been submitted to far and can't wait to see more of your work!